The Peace Walk from New Plymouth to Parihaka Pa took place over three days from Wednesday 15th to Friday 17th June 2016. 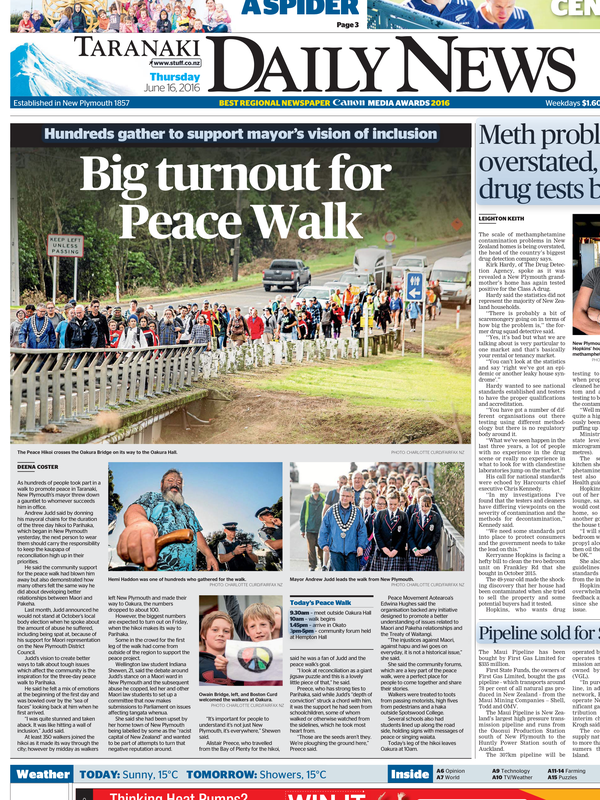 The Peace Walk was sparked by the stand taken by New Plymouth Mayor Andrew Judd over Maori representation on the New Plymouth District Council, and also the history of the treatment of Maori by local and national governments. Mayor Judd has challenged New Zealanders to wake up to ingrained racist attitudes, and to join him in making a stand for better inclusion of New Zealand’s Treaty partner in our civic affairs. Mayor Judd’s stand has attracted a considerable amount of criticism and abuse ... a response which led him personally to decide not to stand for office again at the next local body elections. 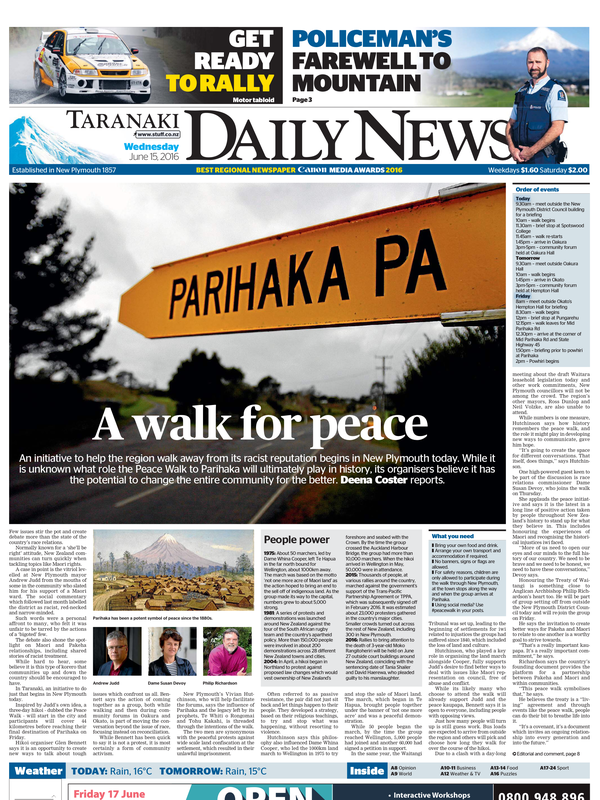 Instead, he decided to try and “change the conversation” by leading a symbolic walk to Parihaka - the internationally historic Taranaki village which is synonymous with a message of peace and passive resistance. 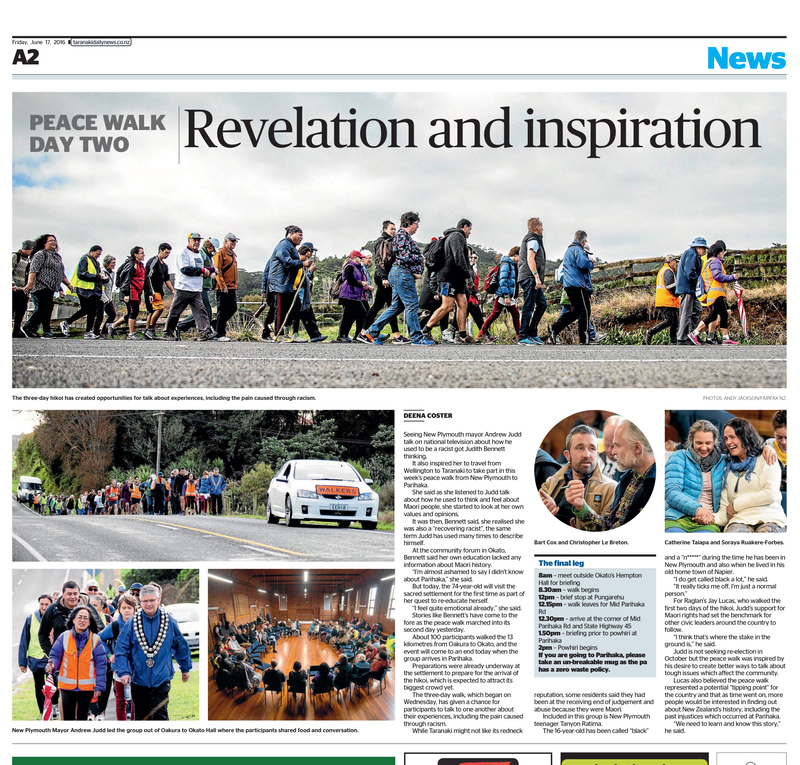 Hundreds of Walkers of all ages and cultures joined the Peace Walk over the three days, with the theme of “walking into a new conversation” about race relations, civic inclusion, and peace and safety in Taranaki and New Zealand. Participants were encouraged to join as much of the journey as they were able, or to come to the community conversations that were held in local halls at the end of each day. The Peace Walk became an opportunity for participants to both walk and talk together - to respond to and engage with the matters Mayor Judd has raised, and to explore ways to continue the dialogue about these important issues in our communities. "How the Taranaki Maori ward debate began"
"The United Nations is backing Mayor Judd"
"New Plymouth Mayor Andrew Judd not standing again"
"Does New Zealand have a problem with anti-Maori Racism?" "New Plymouth mayor gains nationwide support"
"We've got to do this better, New Zealand"
Comment: "New Plymouth's redneck reputation a bad image"
"Walking Into a New Conversation - some thoughts on the Taranaki Peace Walk 2016"
"Peace hikoi to Parihaka presents new possibilities for partnership between Maori and Pakeha"
"A Chance to Grab the Olive Branch"
"Aotearoa New Zealand: We need to talk"
"Mayor Andrew Judd leads a Hikoi in Taranaki"
"Faith in Taranaki: Judd's inspiring walk of peace"
"Peace walkers warned not to react to provocation"
"New Plymouth hikoi: We care about each other"
"Hundreds join peace hīkoi to Parihaka"
"Parihaka walk begins: RNZ Checkpoint"
"Peace hikoi heads to Okato"
"Stories and experiences shared during Taranaki's peace hikoi"
Maori TV 17 June 2016 Te Kāea spoke to some Parihaka locals about what this hikoi means to them. 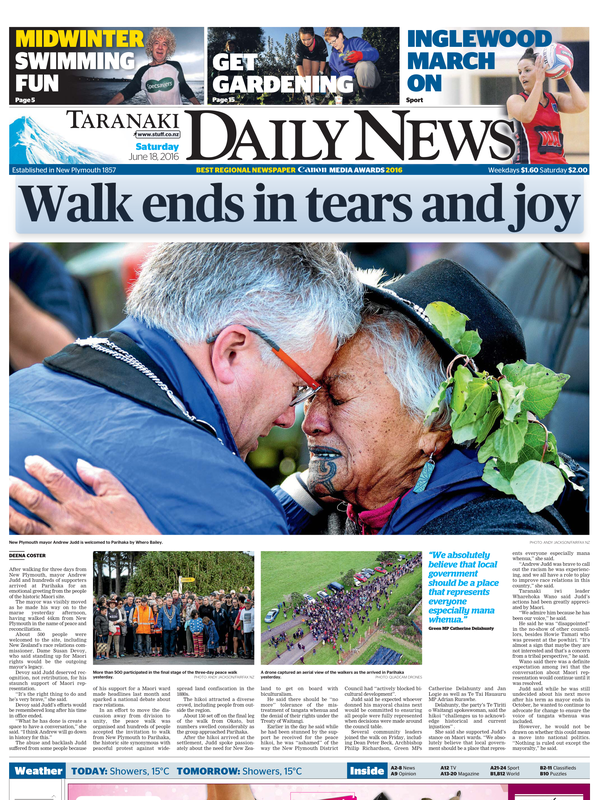 "Emotional scenes as hikoi reaches Parihaka"
"New Plymouth Mayor Andrew Judd on peace hīkoi to Parihaka raising biculturalism"
"Parihaka powhiri provides emotional end to three-day peace hikoi"
"Pākehā needed to lead hikoi - councillor"
Comment: "Hikoi highlights uncivilised reaction to mayor's call to recognise Maori role"
July 2016 Cover Story for Ten One, the New Zealand Police's magazine. 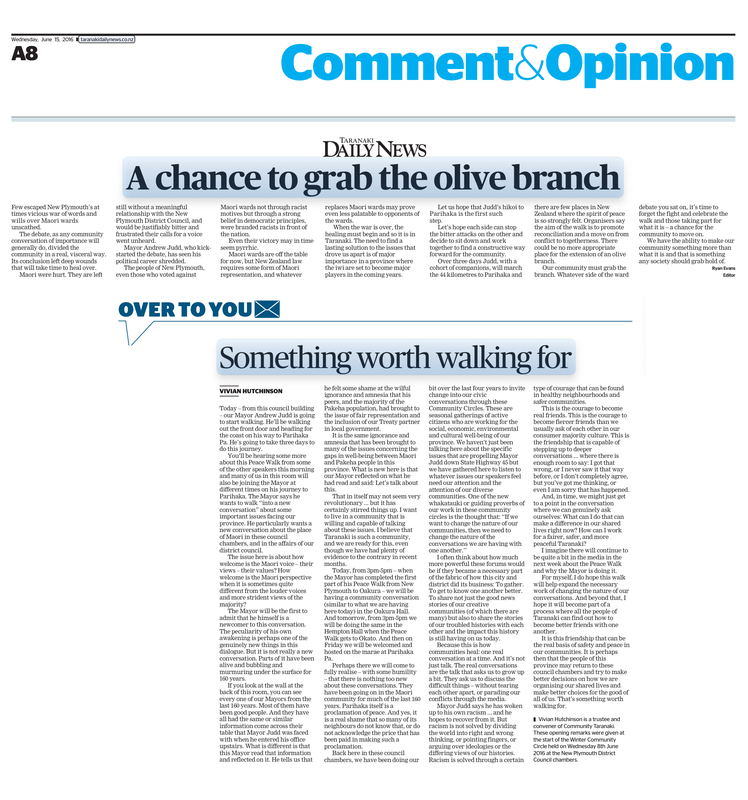 Paper: "Watching the Seabirds at Waitara"
"Judd wins friends and fan mail"
"History will judge outgoing mayor's legacy"
Andrew Judd's message for Waitangi Day 2017: Challenge the thoughts that have been planted in you, all the myths presented as facts – truly challenge them. Get onto a marae and look into the eyes of Maori. It wasn’t reading a book that changed me, but seeing and speaking to real people in their environment. I’m not trying to be a Maori, because I’m not one. But we have to stop this cycle of ignorance. We haven’t confronted our past as Pakeha. I feel lied to and robbed of that knowledge, because I wasn’t told it at school. It’s not about blame, because that’s history. It’s about finding a way to move forward. But it will be a generational shift and it will take time.